AMMS recognises member excellence in research and microscopy with awards presented at our biennial conference. Our next conference coincides with the International Microscopy Congress, which will take place in September 2018. How to apply: email your application/nomination with supporting documentation to the AMMS Secretary. The application deadline for all research awards is Friday 1st of June 2018. Applicants for all awards must be financial members of AMMS. Click on the award categories below to see award criteria. Excellence in developing or applying electron microscope techniques in the physical or chemical sciences. The John Sanders Medal was established to promote excellence in developing or applying electron microscope techniques in the physical or chemical sciences, and to perpetuate the name of John Sanders. The award is open to microscopists residing in Australia for at least five of the past seven years preceding the date on which the entries close. The medal is to be awarded for excellence in developing or applying electron microscope techniques, with particular attention to problems of practical importance in the physical and chemical sciences. The award shall be given for original research making, in the opinion of the selection committee, the most important contribution to the subject as defined above, and recorded in papers of international standing published during the previous five years, and supported, where appropriate, by unpublished papers ready for publication. Applications, which can come either from or on behalf of a nominee, should include the names of two referees, and a short statement of the research for which the nomination is made. The Awards Committee will make recommendations to the Executive Committee. Open to electron microscopists working in the physical sciences. The Thermo Scientific Cowley-Moodie Award is open to electron microscopists working in the physical sciences, and will provide an international air ticket for the recipient to present a paper at an international scientific conference and/or to visit overseas scientific laboratories within twelve months of the award. The award will be judged on the basis of a piece of original research in the physical sciences involving electron microscopy. The work must have been carried out in Australia. Candidates are invited to submit applications, or can be nominated. Preference will be given to early to mid-career researchers. Past applicants are encouraged to re-apply. a brief statement outlining how the award will be used. All eligible applicants will receive a certificate and a small reward. 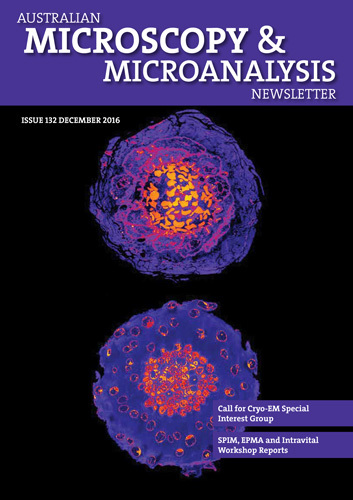 Open to microscopists working in Biology with $2,000 award. The David Goodchild Award is open to microscopists working in Biology and will provide A$2,000 towards either; presentation of a paper at a microscopy meeting of international standing, or, a visit to an overseas laboratory. Candidates are invited to submit applications, or can be nominated. Preference is given to early to mid-career researchers, particularly applicants who have not previously travelled overseas to attend a conference. Past applicants are encouraged to re-apply. The Awards Committee will make recommendations to the Executive Committee. Open to microscopists working in any field with $2,000 award. *This is a new award created as a result of a proposal approved by the membership at the 2016 AMMS AGM. The Society expects to announce a formal name by which the award will recognized when the award is first presented during the IMC19/ACMM25 conference in Sydney in September 2018. The Microscopy and Microanalysis Award is open to microscopists working in any field and will provide $2,000 towards the recipient presenting a paper at a microscopy meeting of international standing or visiting overseas laboratories. The award will be judged on the basis of a piece of original research involving the development or application of advanced microscopy and/or microanalysis. The substantial body of the work must have been carried out in Australia. Candidates are invited to submit applications, or be nominated. Preference will be given to early to mid-career researchers. a brief statement of how the award will be used. Sponsored by ProSciTech, this Bursary is intended to further cooperation between microscopists in Australia and New Zealand. Sponsored by ProSciTech, this Bursary is intended to further cooperation between microscopists in Australia and New Zealand. The bursary covers all expenses for economy air travel to the next New Zealand Microscopy Conference, registration fees, and A$500 for living expenses. This bursary is awarded to an Australian and a New Zealand resident on alternate occasions. provide the contact details of two professional referees. All candidates will be judged on an oral summary of the significance of their work, presented at ACMM. The presentations will be judged and the winner will be announced at the conference. The name of the runner-up will be held in confidence, in case the winner is unable to claim the prize. Minor deviations from the requirements may be accepted if indicated in the application. Two Prizes, comprising of a certificate and A$500 are awarded for scientifically significant student presentations given at the ACMM – one for Biological or Medical Sciences, and one for the Physical Sciences. A panel of national and international microscopists present at the conference will judge the suitability of presentations for award of the Prizes. write a one-page report on their research for the AMMS Newsletter. The John Farrant Prizes were instigated to honour the name of John Farrant and his contribution to the establishment of a thriving electron microscopy community in Australia. The Prizes are funded by a generous gift from Mrs. Patricia Farrant.